for what exact purpose, I am not entirely sure. I saw this sign as I was walking past a store yesterday. their English needs work and they are really looking for something quite different. Maybe the first line should have read, Delivery Driver Wanted or maybe they really do prefer the direct approach. Either way, I am sure the phone enquiries were very interesting. Put your deepest voice on Lilly and call the number! The mystery needs to be solved. Hope you are keeping warm wherever you are. It is very chilly in Sydney and I am sitting on top of a heater with my uggs and trackie and jumper! thanks mate - I just looked back and notice you answered my last comment and voted I assume. The tally only shows a percentage so I can't tell what the vote count is. Hmm, should I start that letter to Barry and Michele about the visit? Of course you know I'm talking about our neighbors Barry and Michele. Well at least the sign did NOT say "Deliveries in the rear". You must have a good number of Vietnamese living there. Well then, I can see why this would make you stop and take a second look. It does bring to mind a whole lot of ideas. Looks like the 'ad' had the desired effect! Hope all is well, Lilly. HaaaaaaaaaHaaaaaaaaaa, oh dear lost in translation isn't it? Hopefully they get a few takers or a few unexpected deliveries, ha ha. @ Lisleman - yes I voted for you! Yes it is called little Vietnam is my suburb. Beautiful, gentle people. @ Kay - yes it made me laugh! @ Sarah, well they say you have to ask the universe what you want so who knows. 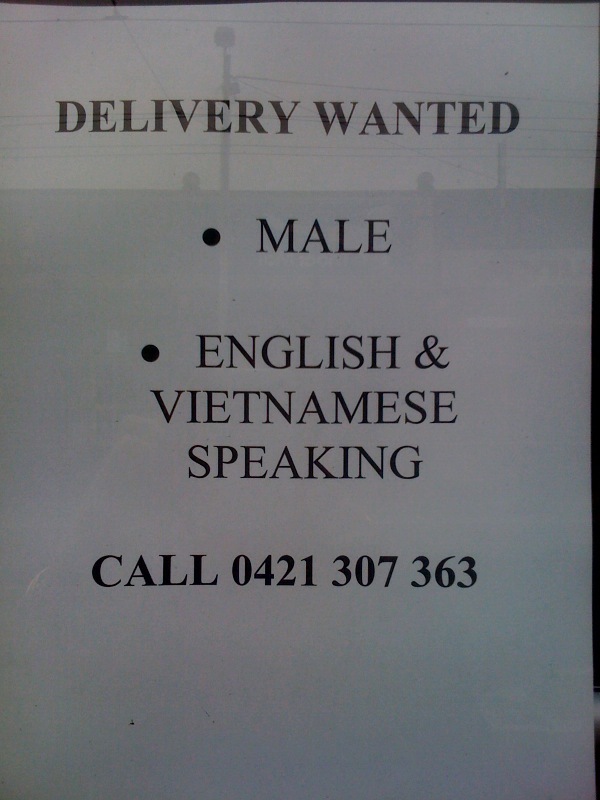 someone in my suburb might have been delivered a male who speaks English and Vietnamese making all their dreams come true. I must try it, lol! Hysterical ... what a way to begin my day. Would love to listen in on those phone responses they get. LOL! Oh, that is just too cute - the mind boggles! Well spotted that woman (grin)..
@ Helen, gosh your profile picture is amazing!! @ Betty, Shrinky, Anton and Christine - glad you found the funny side like I did. @ Lilly, did your ring and find out?